We began the month with (yet another) mainly rain system that brought just a little bit of sleet and freezing rain for far interior portions of New England. Temperatures warmed well into the 50s as a result of the storm bringing in a surge of warmth. The ensuing cold front pulled temperatures back below seasonable for the time being. Following that front, an offshore system on the 5th resulted in a rare inverted trough in southern NJ. The narrow corridor between Philadelphia, PA and Atlantic City, NJ received between 2 and 5 inches as a result with nearly 8” in Brigantine, NJ! Outside of minor interior snowfall, the next several days featured a continuous supply of dry air thanks to multiple high pressure systems kept things quiet. 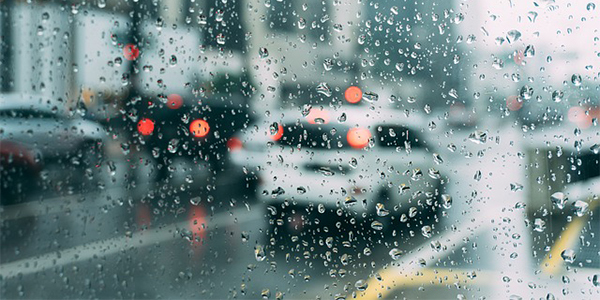 During the second week, however, a massive system impacted the mid-South. Tennessee, Virginia, and North Carolina in particular received significant snows, including some freezing rain and sleet. In fact, Richmond, VA saw a bit over a foot of snow/sleet, which essentially satisfied their season’s worth of snowfall, at least in terms of averages! Meanwhile, a cool pattern continued across the Northeast as temperatures fell 10 degrees below normal. A clipper-like system then impacted northern NJ/PA through New England. This did not amount to much even in elevations where a few inches at best fell. To add to an already weak track of snowfall, warmer temperatures followed over the next few days that allowed for rainy system on the 15th and 16th that brought up to 1.00-2.50”. This would be usurped by an even stronger system on the 20th and 21st. Temperatures were sent 10 to 20 degrees above normal as a robust southerly stream of moisture pushed temperatures well into the 60s nearly everywhere. Cooler weather returned just in time for the holidays, but snow was offset by just one day to give some people a potentially white Christmas. Instead, it snowed on Christmas Eve as a weak clipper brought minor accumulations across most of New England into northern NJ and northeastern PA. Unfortunately, because accumulations were less than 2” for much of the region, most of the snow melted before Christmas Day, but it did actually end up quite seasonable. Warmer days in the 50s then returned across the Northeast which prohibited additional snowfall. Just one more minor event on the 30th gave snow in the same spots, but this time it generally remained under 1”. However, another system quickly followed and unsurprisingly for December 2018, it was raining heavily to ring in the New Year! (Although at least it was not in the single digits like last year). As one could gather, the month was significantly more wet than white and most areas between I-80 in PA/NJ and Fredericksburg, VA, received basically no snow (with the exception of southern NJ). December was 2 to 4 degrees above average, but nothing that took down records. As we have been mentioning in previous monthly summaries though, December’s rainfall continued to pad the precipitation statistics. Washington, DC and Baltimore, MD both saw their wettest years on record at 66” and 72”, respectively. 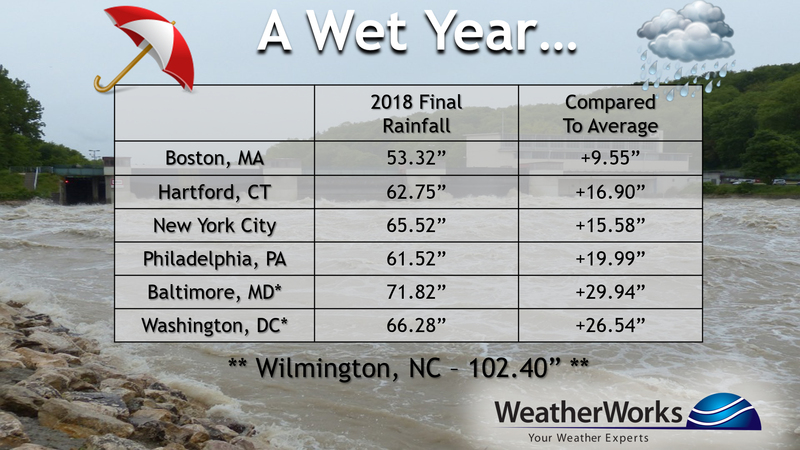 Most other cities up and down the I-95 corridor received either their top 5 or top 10 wettest.